Not a big Tarzan fan myself although I did enjoy watching him on telly and his chimp Cheata. Then again I wasn’t into Action men either so playing with “figures” was not something I did in my childhood days. Left that excitement for later life. 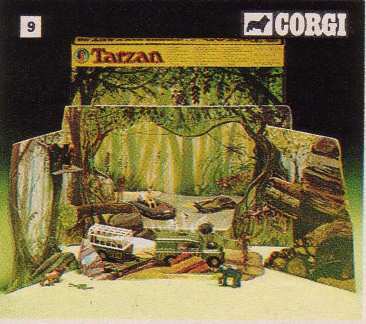 Saying that this does look like a nice little set with the box breaking down to make the surround scene and it included a Land Rover, animal trailer, animals and figures.